Brussels, 10 March 2016 – The first prize of the sixth John Houston EPACA ESSAY CONTEST 2016 was handed over by Lisette Tiddens-Engwirda, member of the EPACA Professional Practices Panel to Katalin Jakucs from Kreab during EPACA’s Annual General Meeting, 10 March 2016. The jury is composed of the members of the EPACA Professional Practice Panel: Lisette Tiddens, Alain Perroy, John Bowis and Tom Spencer. The ,John Houston EPACA 2016 Essay Contest, with the topic “If the EPACA Code of Consuct did not exist, would you invent it?”, aimed to highlight the Public Affairs profession and bring recognition to young practitioners. Young talents under the age of 30 and working for consultancies member of EPACA were invited to take part in shaping our profession by sharing their views and experiences in an essay competition. The Jury was the members of our Professional Practices Panel. Katalin Jakucs was unanimously designated by our Jury as the winner. Her essay showed both talent and originality! 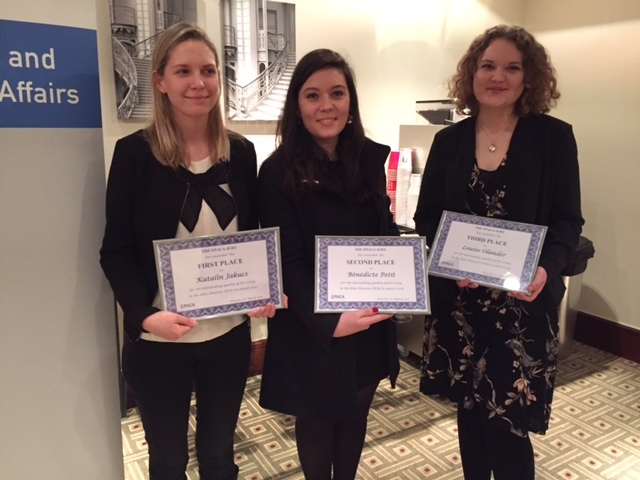 Runners up in the contest were Bénédicte Petit, from Central Lobby Consultants ranking second, and Louise Olander from FleishmanHillard ranking third. We congratulate them for the excellent quality of their essays. High ethical standards and proactive transparency efforts play an important role in ensuring citizens’ trust in the European decision-making process. It also contributes to the acknowledgement of the role of public affairs professionals. Therefore, the EPACA code of conduct exists for a good reason. The question to me is not whether or not I would invent it, but how I would improve it. First, in order to avoid having incomplete and inconsistent information in the Transparency Register, I would complement the code with a provision on public affairs firms that “shall timely and accurately update their entry in the EU Transparency Register”. Second, interactions with policy makers are increasingly shifting to the online environment through social media platforms. Thus, I would add that public affairs practitioners shall act in an honest, responsible and courteous manner at all times, “both online and offline”. Third, the EPACA code should explicitly cover interactions with the media given the regular engagement consultants have with journalists to pitch their clients’ stories. Therefore, I would add that the code applies when acting as a link between the world of business, “media”, civil society and European policy-makers. Forth, public affairs consultancies should show respect and integrity not only when engaging with EU actors but also towards each other. Hence, they “shall restrain from obtaining information and winning competitors’ clients over by dishonest means”. Fifth, to ensure respect for the code’s provisions in practice, I would complement it with a procedure for non-compliance against members that allegedly violate its provisions. Furthermore, all actors involved in public affairs, from trade associations and NGOs to law firms, should commit to greater transparency and should aspire to adopt the highest ethical norms possible. The EPACA code can be a leading example of best practice for the industry. The EPACA Code of Conduct could be compared to the Highway Code. I, a young public affairs consultant, could drive a car without having studied the rules of the road, just as I could lobby policymakers without knowing the Code of Conduct; I possess the technical ability to drive a car, or to alert a lawmaker to someone’s concerns. On a road without rules, some drivers might follow common sense as their guide, but equally others might believe their wealth and power, embodied in fast cars, are what dictates behaviour on the road. What is needed to avoid chaos, as Hobbes would say, is a Leviathan, or a code. Whatever direction we are taking, we are all using the same roads. Lobbyists, as drivers, must follow a code if they are not to injure themselves, the people they are carrying or wider society. In fact, lobbyists are more like bus drivers: they transport different interests – between civil society, businesses and policymakers. As professionals, they must self-regulate and comply with the highest professional and ethical standards. As they are carrying different interests on behalf of others, transparency is what make them reliable and gives assurance that interests will arrive at destination without taking any detour, getting lost or worse. Bus drivers carry a responsibility that goes beyond their own interests or those of the people they are transporting. The EPACA Code of Conduct contributes to the improvement of the lobbying profession and to the preservation of democracy. If it did not exist, then it would be needed. Would I invent it? On my own probably not, as it should be a collective effort. Would I follow it, adapt it to my daily work and to the new issues I face as a public consultant? Then the answer would be yes. Imagine this scenario: a young professional comes to Brussels to work in public affairs. But it is a different Brussels and a different kind of public affairs than our own – the EPACA Code of Conduct does not exist. What kind of environment would this person be working in? Probably one lacking many of the advantages we enjoy today. This is because the twelve golden rules of EPACA are guarantors of integrity, honesty and confidentiality. The Code affords a level of transparency and trust that is essential to public affairs. It promises that client interests are professionally represented, and assures the EU institutions that the information they are given is trustworthy and transparent. Above all the Code guarantees the European public that public affairs are conducted in the spirit of democracy and openness. This is particularly important today, when Brussels politics and the democratic status of the EU are ubiquitously called into question. The Code thus helps ensure that public affairs remain just that – public. Yet, it is important to note that the Code as we know it could never be “invented” by a single person. It is an organic creation constantly evolving to incorporate the changing challenges to the profession, not a static list. It is also a collective effort, and having been jointly developed by the professionals who subscribe to it is partially what gives it its legitimacy and efficacy. So, there can be no doubt that the twelve rules of EPACA are indeed golden, and that if they did not exist, every public affairs professional would have good reason to wish them into being. And yet, since it is partly the organic process in which it is developed which gives the Code its value, for any one person to “invent” it would neither be possible nor desirable.